Nearly one year ago, on April 12, 2018, an incident at a single Starbucks location — just one out of its 30,000 worldwide restaurants — was enough to earn days of national headlines, place the brand’s operations and values under a microscope, and set in motion steps that led to thousands of its shops shutting down for an entire afternoon. As we approach the one-year anniversary, the event still underscores two daunting realities for retailers. First, crises can happen to any brand, and as a company’s storefronts multiply, so can the likelihood of a crisis. According to a McKinsey report, between 2010 and 2017 headlines with the word “crisis” and a Forbes 100 member appeared 80 percent more often than in the previous decade. For even the strongest, most ethical and most successful companies, reputation is often ultimately in the hands of store-level employees – some of whom may be in their first experience in the workforce – engaging with customers on a daily basis. crises can happen to any brand, and as a company’s storefronts multiply, so can the likelihood of a crisis. Just one mistreatment of a guest, one error in judgment, one violation of company policy or one failure to handle an incident appropriately, and a brand with sterling track record may face fan furor. Second, the mobile devices that rarely leave our hands have turned customers into an ever more mobilized community of media correspondents. One local market misstep can instantly become a scathing post or video, and within minutes can spawn outrage across social communities and a slew of calls from national reporters and producers. And as more and more crises generate headlines, it is logical to assume that increasing numbers of customers will recognize and wield their power in raising visibility and awareness when brands fail to meet standards and expectations. Retailers across almost every industry – from restaurants to hotels to fitness clubs to grocery chains to department stores – face threats every day. Consider crime, cyber breaches, labor shortages and turnover, safety issues, product recalls, negative reviews and so much more, and it becomes clear that brands should think of crises not in terms of “if,” but in terms of “when.” And when the crisis comes, with more intensity and scrutiny than perhaps ever before, it’s the brand’s response as much as it is the initial wrongdoing that is often remembered, making prior planning particularly imperative. 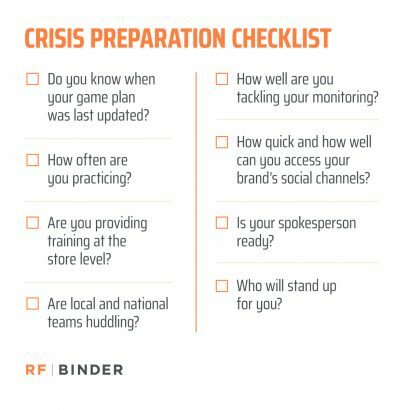 Effective crisis preparation can be equated with fielding a winning football team. Assemble a roster of the right players at the right positions. Create the playbook and make sure everyone knows it. Anticipate any possible scenario and how to react on both offense and defense. Run through your drills over and over again before it counts for real. But crisis preparation is more than merely having a plan, some topline messages and a contact list. It’s an ongoing process that can affect pieces of the business outside of communications. For a quick assessment of your own preparedness scorecard, here are just a few questions to consider. Do you know when your game plan was last updated? Beyond just keeping current your contacts, responsibilities and key messages, an effective crisis communications plan must continuously evolve through anticipating and addressing new potential threats or scenarios stemming from changing circumstances, industry trends, technologies, customer behaviors, competitor experiences and more. How often are you practicing? Crisis communications is like any other skill. The amount of practice and preparation is in direct proportion to how fast and effective you can act when a real crisis hits. Is the team ready to implement the right steps quickly? Does everyone understand specific individual roles and responsibilities? Are your key spokespeople ready to jump into a crisis situation and deliver brand-aligned messages at the drop of a hat, or could they use a refresher? Are you providing training at the store level? 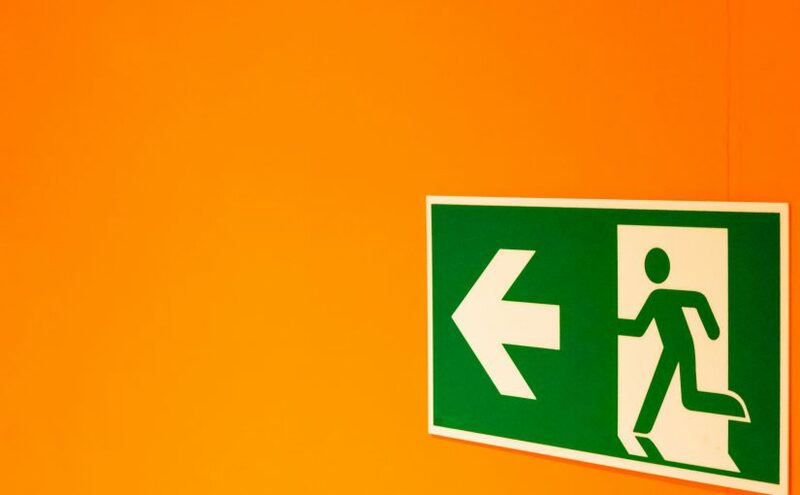 Far beyond a call number posted on a wall, do store employees, managers, franchise owners and regional brand leaders have a clear understanding of what can constitute a crisis, and what to do and not to do in various situations? Do they appreciate the importance of following set protocols and acting as quickly as possible? And, especially, do they know the correct procedures for how to handle a call or surprise appearance by a member of the media? Are local and national teams huddling? What mechanisms are currently in place to ensure that local-level initiatives align with overall brand values? Admittedly, this may fall in the category of risk management as opposed to preparation, but it’s an important facet. Corporate PR, legal, marketing, brand managers, outside agencies and others need to coordinate and collaborate with local markets to help mitigate the threat of any programming or content that violates brand standards or mandated guidelines, or that could be confusing or worse offensive to customers. Local marketing should have mechanisms in place to leverage corporate-level resources to ensure values are upheld and potential problems caught. How well are you tackling your monitoring? A crisis or even the risk of an issue can arise anywhere, and the consequences of how quickly you do or do not identify and react cannot be over-emphasized. Consistently keeping eyes on social communities – and not just your own channels – along with media outlets, review sites, news and content aggregators, is critical. Fortunately, numerous technologies have emerged (and continue to improve) in helping to tackle such an enormous task. There are tools such as Brandwatch to help identify and analyze key conversations and trends. And other tools, such as Dataminr alert you to a critical event or incident, enabling you to act faster and stay one step ahead. How quick and how well can you access your brand’s social channels? The fastest car in the world can’t go anywhere if the driver(s) can’t find the keys. You may need to immediately address your community and share vital information and updates via Facebook, Twitter, LinkedIn and the brand’s own website. If the person or persons who have the passwords and access to begin social communications are unavailable for any reason, are there steps in place to enable others on the crisis communications team to avoid any possible delays? And, do others have enough familiarity and savvy with social channels to engage effectively? Is your spokesperson ready? In preparing for a crisis, spokespeople can be selected for several reasons, such as leadership position, subject matter expertise or even location. But will an appropriate spokesperson be an effective spokesperson? Can he or she deliver when the cameras are rolling and the microphones are thrust in their face? Can they handle unexpected questions, or address situations when all the facts are still being determined? Media training and message review can be essential for any potential spokesperson to ensure that a crisis situation is framed correctly and information provided to the public clearly and calmly even under the most stressful situations. Who will stand up for you? When a crisis comes, and your brand’s reputation is called into question, who else beyond your fans might provide critical support? Are your relationships with key local organizations, national trade associations, public officials and advocacy groups strong enough so that they understand, and will be able to attest to, your contributions to your industry and the communities you serve? It’s an oft-repeated axiom that there are now only two kinds of companies: those that have had a major crisis, and those that will. So as “if” becomes “when,” and “when” becomes “now,” are you ready?